The Porsche 928, perhaps like any great invention, was born out of necessity, and the Porsche 928 model was created in a bid to revive and maintain potentially declining consumer interest in the Porsche car range. Its predecessor, the Porsche 911 had been on the market for almost ten years with no successor or improved model, and the Porsche manufacturers were uneasy that their market share was in danger of stagnating. Sales for the Porsche 911 had already steadily declined and share values had dropped as well. Additional pressures were faced in the guise of ever increasingly stringent and draconian national legislation that imposed harsh requirements on safety, emission levels and speed ratings. This latter requirement seemed to imply a water-cooled engine in front, which by then was seen as a given for all future production Porsches and is to this day, and the new model was intended to be a hybrid of the best features of a sports coupe and a luxury sedan. When the finished product was finally realised for sale on the public market in 1978, despite it being widely and critically acclaimed for its comfort, safety and ergonomic design, sales were initially very tentative indeed. The Porsche 928 was unveiled at the 1977 Geneva Motor Show and went on to be named Car of the Year 1978 – the first time that any sports car has ever won this award. A major deterrence was the high sale price of the 928 model, and the large (some viewed as bulky) design of the car deterred many actually driving people to the old 911 model. Consumers were so put off by the bulky design of the car that Porsche issued an official statement to allay their fears, although it later was discovered that even Dr. Fuhrmann didn’t like the 928 model when he first saw it, though he subsequently relented. The company’s concerns regarding rear-engine legislation were never crystallised, and whilst the 928 model did eventually begin to attract more and more customers, even enjoying its own (albeit limited) loyal fan base the sales of the 928 model were never in the same league as former Porsche models. In 1995, the company discontinued the 928 model altogether. Its original intention and raison d’être of the 928 model, that is, to replace the 911 and act as the next stage of evolution for the Porsche brand never really worked out. Many felt that the 928 model whilst successful, was something of an anomaly, a deviation from the standard production line and that its success was nothing more than a lucky break. 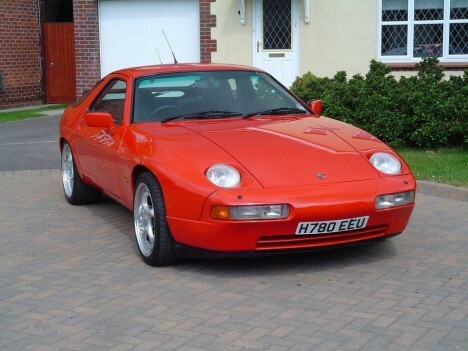 Whilst the 928 became successful in its own right, the 911 model was still held in high regard, and enjoyed a very strong and committed fan base. The 928 model also utilised a transaxle in order to optimize the weight distribution of the car, and to aid its balance, allowing for the heavier weight load of the 928 to match its predecessor, the 911 in terms of ease of handling and steering so much so in fact, that the 928 was classed as one of the most relaxing vehicles to drive at that time! In order to counter increasing criticism from both rivals and consumers alike, that the 928 model was not as exciting as some of its rivals, Porsche introduced to the market a new updated CT version of the car. The actual body of the 928 was primarily made up of galvanised steel for longevity, however, the doors and hood of the car were manufactured using aluminium, and offered a very spacious and generous luggage capacity.